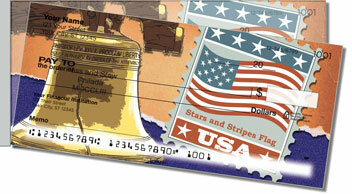 Iconic images of the Liberty Bell and an American bald eagle flank the patriotic postage stamps featured on our Flag Stamp Side Tear Checks. 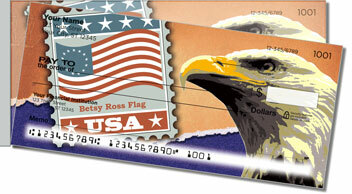 From Betsy Ross's original banner to the 50-starred Old Glory that still flies today, the U.S. flag stamps shown on these checks truly represent the evolution of our nation's standard. 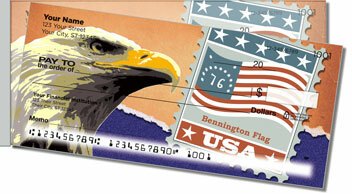 Of course, you don't have to be a stamp collector to appreciate these patriotic checks. Your American pride will do! 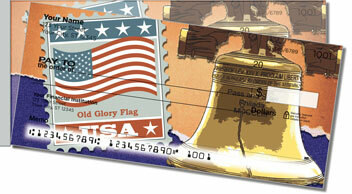 We are also pleased to offer this series as a set of matching address labels. Personalize both great products for yourself today!